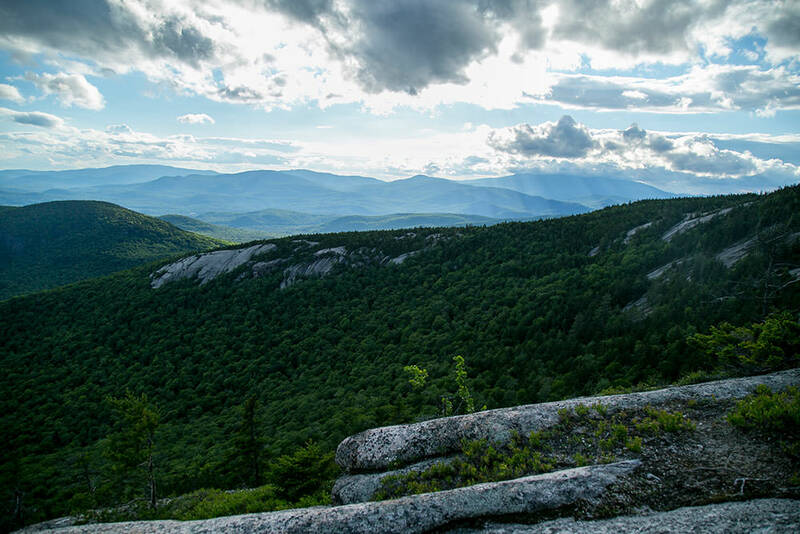 Waterville Valley features some of the best hikes and views in the White Mountain National Forest! 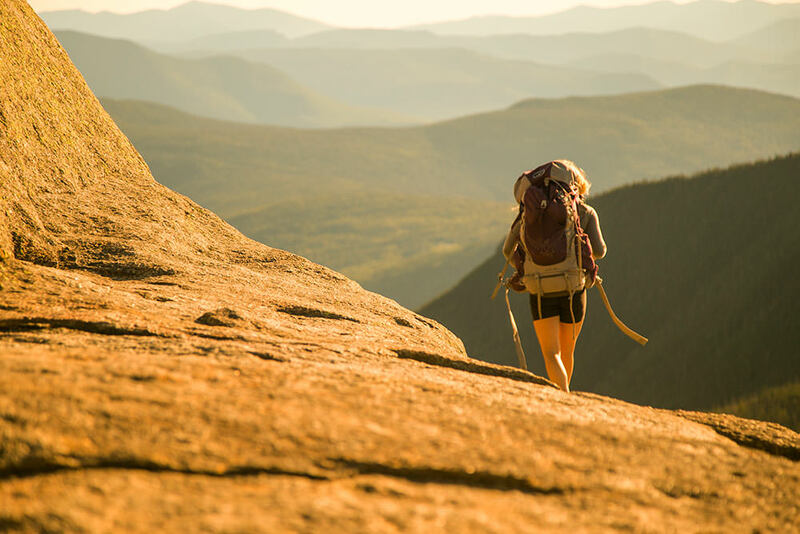 Go adventuring on 7 majestic 4000' NH mountains that surround the Valley, as well as rewarding shorter trails for the family. After a day in the mountains, cool off under the many waterfalls, streams, pools, and rivers. 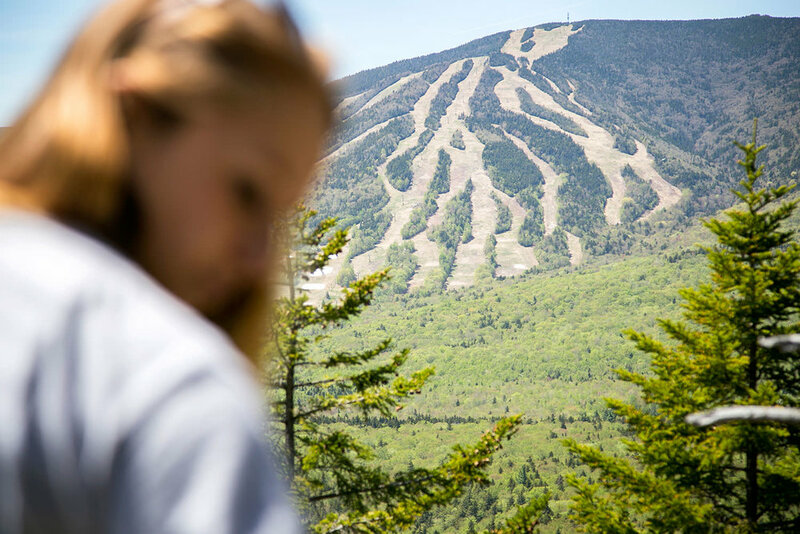 Waterville Valley is the perfect hiking destination. Brooks and cascades, glacial erratics, flumes, rock slides, and stunning vistas are some of the many highlights. With mountains soaring upward from every side, Waterville Valley Town Square is the perfect central location to begin a day of hiking. 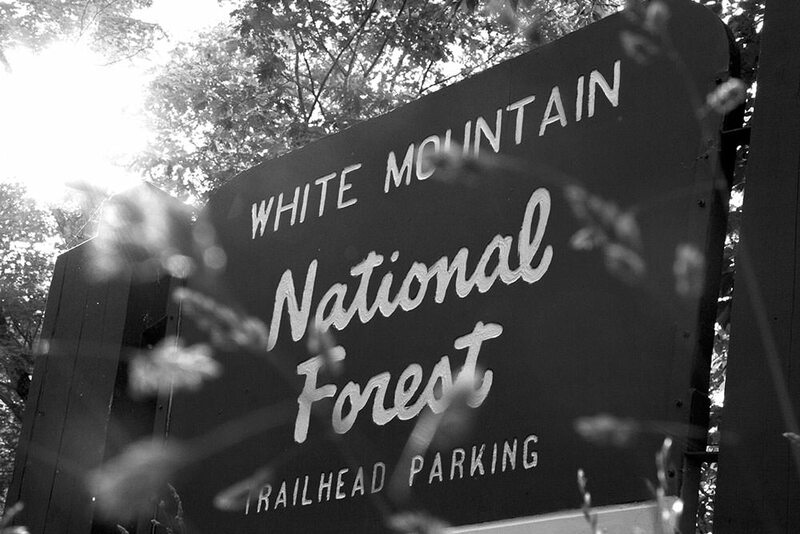 The valley is situated within the White Mountain National Forest, where good ole' fashioned nature reigns supreme. So take a breath of fresh air, and take a hike (we mean that in the best possible way). This is a short EASY hike [1000 ft.], which connects the Pine Flats Trail with the parking lot at the Six Mile Bridge, and can be used as part of a loop with the Old Waterville Road, the Yellow Jacket Trail, and the Pine Flats Trail. To access the trail from the Smarts Brook parking lot, follow the Pine Flats Trail out the back of the lot. The trail begins five minutes beyond the lot, and leads over flat terrain on an old logging road. In about 10 minutes, it ends on Route 49, just west of the parking lot at the Six Mile Bridge. This is a short, EASY trail that leads to the banks of the Mad River [1600 ft], where there are some enormous White Pine trees. It begins off Livermore Road, after the big Boulder on the right and a short rise in the road. 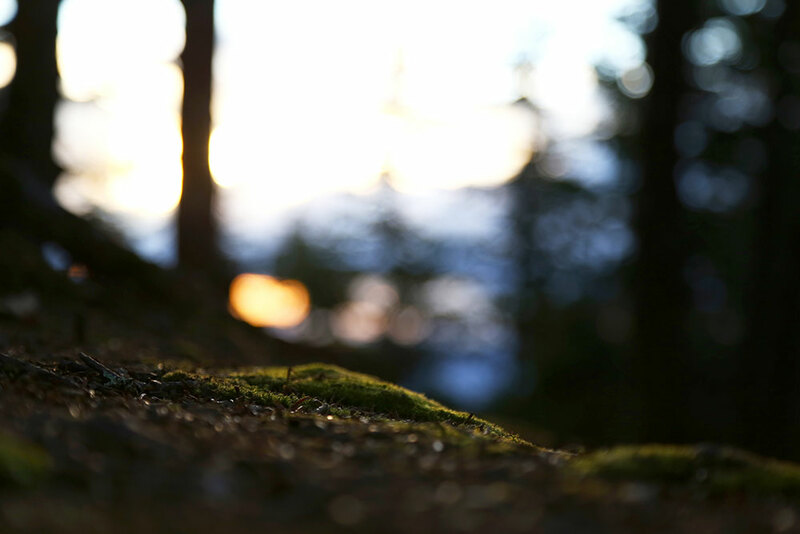 It's a thin little trail that winds through a flat evergreen forest. There are two short somewhat steep sections as you make your way down to the river's flood plain, before the trail ends beside the Mad River. The boulder to which this EASY trail leads sits in the middle of Slide Brook [1600 ft] as it runs alongside the Livermore Road. The trail begins off the Cascade Path, on a well-defined roadbed in the middle of the Cascade Ridge development. It soon crosses a paved cul-de-sac, and continues on the other side. At this point, the trail is both the Boulder Path and the Lower Snow's Mountain cross couintry ski trail. After a little rise and turn in the trail, the Boulder Path leaves the ski trail, bearing off to the left at a small inconspicuous sign, and descends gradually toward the brook. At the bottom of the descent, the trail connects to an old roadbed. Turn left and walk a short distance over two short footbridges to the boulder. Boulder Path connects to Livermore Road, but it's difficult to cross in high water. This is an EASY hike that brings you past the scenic Smarts Brook Gorge [1000 ft.], and a locally rare stand of Red Pine trees. From the Smarts Brook parking lot, walk out the back of the lot. There is no sign, but the trail is well worn and distinct. Continue alongside the brook on your right, past a sign on the left for the Old Waterville Road Trail, and another unmarked trail on your left, staying close to the brook. After leaving the gorge, the trail rises up to a flat section of terrain with an impressive stand of Red and White Pine trees. The trail then descends the plateau and ends at a junction with the Yellow Jacket Trail. This is an EASY trail used primarily to access East Pond [2600 ft.], a mountain pond surrounded by the steep peaks of Mount Osceola's Scar Ridge. The trail begins on a logging road grade, and crosses an old railroad bed, where the Little East Pond Trail diverges left. This is a longer route to the pond, but also easy, as it traverses the hillside to a small shallow pond, and then cuts back to the east and intersects the main trail just before it comes out onto East Pond. The main trail remains on the old logging roadbed all the way to the pond. From there, it continues to the left of the pond and traverses easily through the woodlands all the way over to the Kancamagus Highway. The trail begins at the southwestern end of the Smarts Brook parking lot, on your left as you head out of Waterville Valley on Route 49, just after Upper Mad River Road crosses the river on your right. From the parking lot, cross the brook on the road. On the other side of the brook, the trail turns left and enters the woods on some log steps, joining with an old roadbed. Soon a cross country ski trail with a blue marker bears to the left. Stay right and follow the trail through a stand of hemlocks until you join with a logging road. Here, the Tri-Town Trail continues straight ahead. To remain on the Smarts Brook Trail, turn left at the intersection on the logging road. After a while, the brook will come alongside the roadbed on your left; and soon after that, you will come to a forest protection area, where there is a popular swimming hole [40 min. ], and therefore camping and fires are prohibited. The upper trailhead of the Tri-Town trail enters 10 minutes up from the pool. The Yellow Jacket Trail diverges left shortly after that on a wooden bridge crossing over Smart's Brook. Continuing up the Smarts Brook Trail, you soon see a beaver pond on your right. After this, the logging road diminishes and becomes more of a trail as it continues gradually up the valley, past several big boulders, staying alongside the brook for most of its length, until it finally connects with the Sandwich Mountain Trail near the summit. This is an EASY hike that brings you to the summit of the former Snow's Mountain alpine ski area [2000 ft.], offering nice views to the west and north. The trail begins off the Cascade Path and climbs gradually, past a large boulder on the left [Elephant Rock], through a mature hardwood forest and out at the top of the former Beanbender alpine ski trail. At the summit, the Greeley Ledges Trail emerges from the woods on the opposite side, and the service road down to the Cascade Path heads away from the former ski slope. This is an EASY hike used primarily as a loop trail with the lower section of the Smarts Brook Trail. To access the trail, follow the Smarts Brook Trail for 10 minutes, and then bear right off the logging roadbed at the sign for the Tri-Town Trail. The trail brings you in a long loop, characterized by steady inclines and good footing, up to a clearing at a height of land [1200 ft.]. It then descends gradually back down to the Smarts Brook Trail. To make a loop back to the parking lot, take a left at the end of the Tri-Town Trail onto the Smarts Brook Trail, and continue gradually downhill for 20 minutes. This trail was severely damaged as a result of Tropical Storm Irene in 2011. It was partially rerouted and extensively rebuilt by the White Mountain National Forest, including the installation of a new bridge across the Mad River, which replaces the washed out Knight's Bridge. It was reopened in late 2014. Both ends of the trail remain in their original locations, but a portion in the middle of the trail follows a new route, designed to minimize the possibility of damage in future storms. This is an EASY trail used primarily to access several other hiking trails and upper Greeley Pond [2200 ft.], the source of the Mad River. The trail begins off of the Livermore Road about 10 minutes from the Depot parking lot. It starts as an old logging road cobbled with small rocks, comes alongside the Mad River [20 minutes], on the right, and continues parallel with the river past the Goodrich Rock Trail on the left [30 min.]. Shortly after this, the new routing takes it uphill on the grade of what was formerly the Timber Camp Trail. The Timber Camp Trail diverges from the Greeley Ponds trail on the left after you have ascended. The Greeley Ponds trail continues, and descends back down to the level of the Mad River, which it crosses on a new bridge. For the rest of the distance to the ponds, the trail stays close to the diminishing river as it ascends the Mad River Notch. There are 6 wooden planked footbridges over rills and run-offs adding to the river; and then the trail descends some log steps and crosses the river [difficult in high water], at a point where a cross country ski trail continues straight ahead [blazed blue]. The hiking trail enters the Greeley Ponds Scenic Area on the other side of the river, and is wet in several places as it passes to the left of the lower pond. Stay left as the trail forks and begins to ascend gradually to the upper pond. At the north end of the upper pond a spur path on the right leads down to a small beach. The section of the trail from the upper pond down to the Kancamagus Highway crosses several small brooks and descends gradually. It's often used as an EASY ascent to the beach. This is an EASY hike connecting the Smarts Brook Trail with the Pine Flats Trail, often used as the middle link in a loop route. Accessing it from the Smarts Brook Trail side, the Yellow Jacket trail diverges to the left about 15 minutes after the Smarts Brook swimming hole, 55 minutes from the parking lot. After crossing a bridge over Smarts Brook, take a left and continue downstream, with the brook on your left. The trail descends gradually with some loose footing. Toward the end of the trail, it moves away from the brook; and soon the Pine Flats Trail diverges left. Shortly after that the trail ends, connecting to the Old Waterville Road. This is an EASY trail to a unique section of Slide Brook [1800 ft.] with scenic rapids and pools. To get to the trailhead, follow Cascade Path to a point where it merges with the Lower Snow's Mountain X-C ski trail. From there, cross the bridge over Cascade Brook and follow the ski trail for a short distance to the hiking trail on the left. It wanders through a mature hardwood forest for a very short time, with good footing and very little ascending, eventually crossing the brook and connecting with Livermore Road. It's almost always difficult to cross the brook in high water. This MODERATE hike closely parallels the Mad River, with two steep stairways up to a height of land [1500 ft.], offering interesting river views. The trail begins off the Mad River cross-country ski trail [also part of the "Fit Trail"]. From Town Square, cross the dam and turn right on the Village cross country Ski Trail, and then right on a bridge over Snows Brook. Tylers Spring Trail diverges right before another bridge, this one over the Mad River. At the bottom of where the ski trail rises up the hillside, the Mad River hiking trail heads into the woods. After a small bridge over a thin rill, and a series of steep rock steps up to a plateau, the trail walks along the high and steep-sided glacial riverbank. It soon descends steeply on another long series of wooden steps, down to the river's shore, crosses another rill without a bridge [may be difficult in high water]; and then, crosses over a small footbridge, and a larger footbridge at the confluence with the West Branch of the Mad River. The final section easily traces the river and ends at West Branch Road. This trail was severely damaged by tropical storm Irene in September, 2011. It was restored during 2012 as a result of funding provided by the Town of Waterville Valley and a trail work project managed by the WVAIA. This MODERATE route [a dirt road at first] connects Waterville Valley to the KancamagusHighway, reaching a height of land known as Livermore Pass [3000ft. ], and serves as access to most of the valley's hiking trails. It begins as a Forest Service gated road off the Livermore parking lot. After the clearing known as Depot Camp, Greeley Ponds Trail is on your left, 10 minutes from the parking lot. Boulder Path [15 min.] diverges right and crosses the river just before a short rise in the road. Big Pines Path [20 min. ], is on the left, followed by Kettles Path [25 min. ], also on the left. The road continues with more ascending, before Norway Rapids Trail [45 min. ], diverges right. Livermore Road ends and Livermore Trail [55 min.] begins at a bridge over the Slide Brook. From there, it climbs more steeply to the Mount Tripyramid Trail [65 min. ], leading to the South Slide. The Mount Tripyramid Trail [1:30 min] that brings you to the North Slide, diverges right at a hairpin turn. It is then just a few minutes up the road to the Scaur Ridge Trail, and then the Old Skidder Trail [1:50 min.]. From this point on, the Livermore Trail is used primarily as a x-c ski route as it continues past the Kancamagus cross country Ski Trail on the left, through the Livermore Pass, which is wet and muddy, sparsley blazed and difficult to follow. The descent to the Kancamagus Highway is gradual and seldom used by hikers. This MODERATE hike meanders in a long eliptical loop along the ridge of Snows Mountain [2600 ft], on a rocky footbed. Despite its modest distance, it's deceptively strenuous due to variable footing and the many ups and downs of the ridge. There are two lookouts with fine views to the east, and down the Mad River valley. The trail begins at the Snow's Mountain Parking lot. About a third of the way up the former alpine ski slope on the right hand side, it turns into the woods. Follow the trail through a conifer woods and eventually out into a mature hardwood forest. Once past the Greeley Ledge Trail on the left, the trail comes close to, but does not intersect with the Snows Mountain cross country ski trail, also on the left. There is also a former mountain bike race route blazed in orange in the woods on the right. Continue straight past both of these and follow the yellow blazes into the woods. The trail wanders up the northern side of the mountain. Once the breezy ridge is attained, it levels off somewhat, and soon a very short spur path for the upper outlook is on the left. Continuing down the trail, the lower lookout is about five minutes away. From this point, the trail descends somewhat steeply at first, but soon joins a logging road grade that takes you down the other side of the ridge. As the hike nears its conclusion, the trail intersects the other end of the former mountain bike route, on an old logging road. Continue straight through the intersection, and soon, after a small brook crossing, the trail finishes in a private driveway. From there, one can turn right and walk up the road, which soon terminates at the edge of the former alpine ski slope on which you began; or, walk down the road to the tennis courts, and cut through them over to the parking lot, which is an easier, but longer route. This rocky MODERATE hike leads to a classic mountain ledge [2000 ft.], with views over the tree tops of the eastern peaks of the valley. The trail begins off the Snow's Mountain Trail and almost immediately encounters the ledgy cliffs. It ascends straight up moderate grades on stones and then angles to the left, traversing around the steep-sided face. As it rounds the buttress, a small spur path leads to the ledge. From there, it's a short distance through the woods before the trail terminates at the summit of the former alpine ski area. This is a MODERATE trail that winds creatively through a field of large boulders. It ends on top of the largest boulder [2250 ft], ascended by a tall ladder, where there are great views of the valley peaks, and down the Mad River valley. It begins off the Greeley Ponds Trail about 30 minutes from the parking lot. It climbs somewhat steeply at first, steadily up to a set of stone and wooden steps. From there, it levels off, crosses a small brook and begins to encounter the Davis Boulders, a favorite destination for children. Itpasses through broken-open chunks of granite and under a cave-like passageway. After a set of stepping-stones across a wetland area, it traverses a conifer forest, and eventually circles around to the ladder that brings you to the top of Goodrich Rock. As this is a frequently traveled destination, hikers are asked to be careful of the outcrop communities of lichen and balsam trees growing in this precipitous habitat. This MODERATE hike ascends the Drakes Brook Ravine to the Sandwich Mountain Trail. From there it's a short distance to Jennings Peak [3460 ft]. It's often used as the descending link in a loop over Noon Peak. The trail begins on a gated USFS road, at the northwest corner of the Drakes Brook parking lot, as part of the Lower Fletchers cross country Ski Trail. It follows the brook beneath a high canopy for a short distance, and then leaves the roadbed turning right, crossing Drakes Brook at a wide section that is difficult in high water. It then follows the path of the brook over generally flat terrain for a good distance, before it starts to ascend, gradually at first, with good footing, and then more steeply, where it ends at the Sandwich Mountain Trail. This MODERATE hike is one of the area's most popular hikes, offering fantastic views from many locations along its mostly rock-faced trail. It passes over both summits: Welch Mountain , and Dickey Mountain [2734 ft.]. The trail begins at the parking lot off of Orris Road, just past the Gateway condominiums on Upper Mad River Road. Bearing right at the beginning, it crosses a brook and traverses the foothills of Welch Mountain, and then begins to ascend by switchbacks, coming out onto "Welch Ledge," after 45 minutes, where there are great views of the Mad River valley. From there, the trail rises more steeply among the rocks, with several difficult passages up the ledges, eventually crossing over the Welch summit, and continuing down into the col between the two peaks. After a short wooded section of conifers, it ascends steeply up to the Dickey summit, and then traces the rock ledge back into the woods. It gradually descends a mature hardwood forest back down to the parking lot. This is a heavily used MODERATE hike with steady ascending. It has outstanding views at the summit of Mt. Osceola [4340 ft.] To traverse the ridge and hike to East Peak [4156 ft.], is DIFFICULT. The trail begins on a rocky and rough section that requires more time than might be expected, especially in wet conditions. It ascends the ridge, crossing a spring 2/3rds of the way up. It then climbs by short rather steep switchbacks to the summit, the site of an old fire tower. From the summit, the trail descends steeply into the col. At one point, you have the option to "chimney" down a short rock face, or take an easier route around. There are lookouts to the north as you ascend East Peak. The hiking is steep and rocky. Leave an hour for this, one way. East Peak is a wooded summit marked by a small cairn. Considerable time should be allowed in descending the East Peak. It's a steep trail of loose rock and ledge as it leaves the summit along a narrow ridge. As it descends toward Greeley Ponds, it enters the Greeley Ponds Scenic Area, where camping and fires are prohibited. The trail ends at a junction with the Greeley Ponds Trail, 10 minutes from the beach at the upper pond. 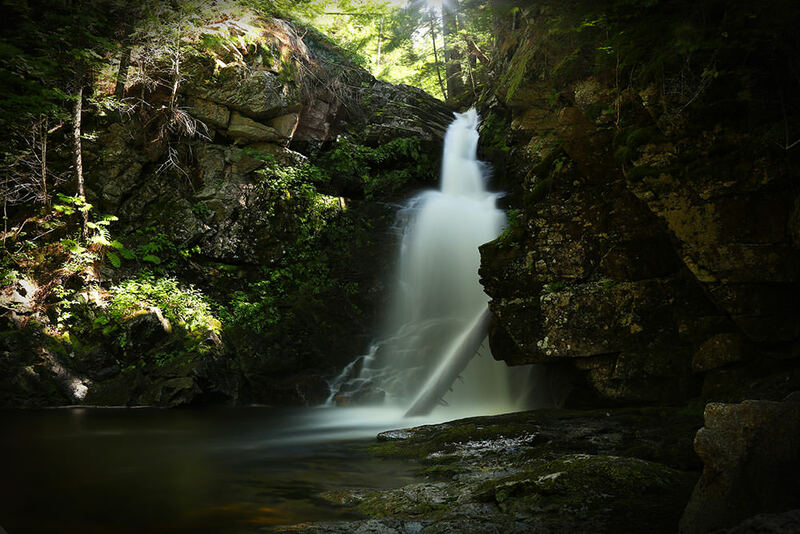 This MODERATE hike heads up the Drakes Brook valley to the Fletchers Cascade [2600 ft.], a picturesque series of chutes and ledges that begins somewhere on the boggy summit of Flat Mountain. The trail begins off the Lower Fletchers Cascade cross country ski trail, just up the hill from where theDrakes Brook Trail leaves the ski trail and crosses the brook. The Fletchers Cascade Trail angles up along the left-hand side of the brook for a fair distance. It can be wet in several sections, requiring some rock hopping and footwork, but it's not steep and easy to follow. After a short footbridge, the trail crosses a high-banked brook [difficult in high water] and enters the Sandwich Range Wilderness. Once the towering rock walls are in sight through the trees, the trail becomes quite steep for a short distance, ascending directly beside the brook, with poor footing on slick surfaces. It eventually hooks left below a tall rock face and comes to an end on a little island in the middle of the brook bed. This MODERATE trail high in the mountains is used primarily as a way to avoid ascending the very steep North Slide by climbing the opposite side of Avalanche Ravine and connecting with the Pine Bend Brook Trail [3600ft.]. It begins off the Livermore Trail, 5 minutes beyond the Mount Tripyramid trailhead to the North Slide. It climbs on a well-defined old logging road for most of its length with good footing and mostly gradual ascending, until it turns abruptly left [east]; at which point, it leaves the roadbed and continues more steeply up the mountainside until it joins the Pine Bend Brook Trail. This is the valley's shortest route to a great view [essentially the same as Goodrich Rock, see above], but it's steep, straight and DIFFICULT, especially in high water. The Scaur [2200 ft], is a rocky outcropping on the Scaur Ridge. The trail is often hiked as the ascending link in a loop with the Kettles Path. It begins off the Greeley Ponds Trail and immediately crosses the Mad River. This is always a difficult crossing, even in low water. The trail continues on the far shore to the left of a boulder. It then passes through a boggy area with a foot bridge. Soon it climbs up the hillside on stone steps, and before a steep set of 36 wooden steps begin, there is a small spur path on the right that leads to Judges Spring. After a short section on a flat terrace, the trail again climbs straight up a steep hillside, though not as steep or as long as the first, leading to a second terrace. Shortly after that, the Kettles Path joins from the right. From there, the Scaur Trail is pretty steep and rocky, but it's only 15 minutes more to the views at the end. This is a DIFFICULT rocky trail that ascends Mount Tecumseh  ft], offering easterly views, and then descends the other side. The trail begins at the north end of the Waterville Valley Ski Area parking lot, and gradually ascends the southern side of Tecumseh Brook for about 15 minutes, then crosses the brook and climbs up the northern foothills with the ski area slopes on the left. Eventually, it descends a small ravine and crosses Tecumseh Brook again. Shortly after that, there's a short spur path on the left that takes you out to the ski slope for a view. The next mile is straight up and rough and rocky and generally slow-going. The Sosman Trail diverges left not far from the summit. This short trail traverses the ridge past a great lookout that gives excellent views to the east, before continuing on to the cell tower at the summit of the High Country chair lift. The Mount Tecumseh Trail, as it continues past the Sosman trail and approaches the summit cone, divides in two, with a southern route to the summit diverging left. Continuing straight, and the trail curls around the northern side to the summit. Once on top, the trail descends fairly steeply down the other side toward Tripoli Road, through thick walls of conifers, into a col. It then climbs again to the crest of the northern ridge, turns west along the ridge, and not long after that there's a spur path on the left with very nice views to the west. Below this point, the trail joins a logging grade and descends moderately down to Tripoli Road. The Tripyramid loop is a DIFFICULT hike. It's recommended to ascend the North Slide and descend the South Slide, because the North Slide is extremely steep and exposed in sections, and more difficult to descend, especially in wet conditions. There are three summits: North Peak [4180 ft.], Middle Peak [4140 ft.], and South Peak [4100 ft.]. There are magnificent views from the top of the North Slide, and good views from North Peak and Middle Peak, especially to the east. The South Peak is wooded, but at the top of the South Slide there are excellent views. It begins off the Livermore Trail. As you hike up from the valley, there are two trailheads for Mount Tripyramid. The first, leads to the South Slide. You want the second, half an hour later, at a hairpin turn. It immediately descends down to Avalanche Brook, crosses it, and continues on a long traverse parallel to the brook to the bottom of the North Slide. Once on the Slide, the trail is straight up and very steep on slabs and ledge rock. The easiest route is to begin on the left-handside, and angle toward the center and eventually end at the upper right-hand corner of the slide, where the trail re-enters the woods. The views are best before the slide narrows at the end. Once in the woods, there's a short steep section through thick conifers to the summit. Hiking across the summits is a beautiful undulating route, passing the Sabbaday Brook Trail junction on the left about half way across. Coming down from the South Peak is a short steep section through thick conifers. When descending the South Slide, which is steep, but not so precipitous as the North Slide, the Kate Sleeper Trail diverges to the left almost immediately. The Mount Tripyramid trail re-enters the woods at the bottom right of the slide. From there, it descends the steep mountainside on a long traverse, eventually joining an old logging road grade running parallel to the Slide Brook, before crossing Avalanche Brook [difficult in high water], just before it ends at the Livermore Trail. Special Thanks to the WVAIA for Hiking Descriptions.